How Exercise Might Help Keep Alzheimer's At Bay People who spend their lives exercising their minds and bodies seem to delay the onset of Alzheimer's, according to an expert panel convened by the National Institutes of Health. Now scientists are trying to figure out how activity protects the brain. People have been trying for years to keep their brains sharp by exercising, staying mentally active and watching their diets. But a panel convened by the National Institutes of Health warned the public Wednesday that it's not clear whether any of these measures can prevent Alzheimer's disease or other forms of mental decline in people. Many scientists are still optimistic about prevention, partly because they are also considering research done on animals. At about the time the panel was releasing its report, a 78-year-old senator was doing something he hopes is good for his brain. 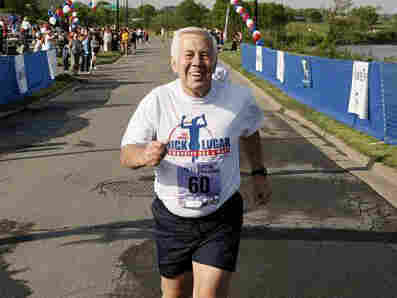 Sen. Richard Lugar (R-IN) was competing in an annual charity race a few miles from Capitol Hill. He's been a runner since grade school and says he thinks exercise helps him remember a lot of stuff, including "the names and places of thousands of people and events that I bring up frequently in the course of debate. "It's very helpful to have that kind of historical knowledge of my constituency, as well as of the world," Lugar said. The panel convened by the NIH wasn't so sure that's why people like Lugar remain sharp into their 70s and 80s. And the panel wanted to make sure the public isn't being misled about the benefits of this or any other strategy for preventing Alzheimer's. So panel members looked only at studies in humans, and they found that some studies of exercise in people have found a benefit while others haven't. Arthur Kramer, a neuroscientist from the University of Illinois, wasn't on the panel, though he was invited to speak to the group. He said the panel is right to be cautious, but that it also makes sense for researchers to talk about the potential of exercise. "The benefits tend to be on the order of a 20 to 30 percent reduction in being diagnosed with Alzheimer's disease and other such diseases," Kramer said. "And again, this isn't universal but this is found in an increasing number of studies." Kramer said researchers also tend to consider studies that show what exercise does for animals. "There are improvements in the chemistry of the brain in terms of the molecules that protect the brain, increases in the number of connections between neurons, which allows us to encode new learning and memory, and even the birth of new neurons in one region of the brain that supports memory," he said. Mental exercise is another strategy that seems like a good idea to many Alzheimer's researchers. After all, it appears to increase connections in the brain and perhaps make the brain more resilient -- in animals and perhaps in people. But Neil Buckholtz from the National Institute on Aging says the panel would need much more than that to recommend a specific activity to the public. "Doing crossword puzzles, Sudoku, those kinds of things -- they're interesting, but the evidence is not available at this point that they actually have an effect," Buckholtz said. The panel seemed most skeptical about studies of drugs, diets and nutritional supplements. Members found some evidence of benefit from omega-3 fatty acids like those in fish. But it found no convincing studies in people that antioxidants like vitamin E could make a difference. Martha Clare Morris, a nutritional epidemiologist at Rush University Medical School in Chicago, is less skeptical. She says there is good evidence that some antioxidants work in animals. "There's a very broad base of animal models showing that vitamin E protects the brain from neuron loss, from DNA damage, from oxidative damage," she said. Panel members say they will consider changing their position on vitamin E and other popular prevention strategies when researchers show they work in people.